The HSLANJ Group Licensing Initiative’s Spring 2018 Offer is available! All medical librarians in the NNLM/MAR, SE/A, and NER are welcome to participate. This is the fifth in a series of articles, highlighting new features, products and collections from vendors. For more information on the HSLANJ GLI, contact Project Manager Robb Mackes (email or 570-856-5952). Deadline to participate is April 27, 2018. The world’s most widely-used medical reference is coming soon in its 20th edition. Thoroughly updated and thoughtfully expanded, The Merck Manual of Diagnosis and Therapy launches later this spring in print and eBook versions. Packed with essential information on diagnosing and treating medical disorders, this comprehensive guide was written by a team of medical experts and includes 36 new chapters. This book is intended for everyday use by health care professionals for delivery of the best care to their patients. Medical librarians know that this reference is a cornerstone of any collection. Rittenhouse is pleased to partner with Merck to make the print version of this iconic title available. And, for librarians with an active R2 Library collection, we are happy to announce that this go-to resource will be available as part of the growing list of FREE titles. Simply add the Merck Manual to your collection and access is enabled at NO CHARGE; integrated, searchable, and ready to help support your physicians and staff. 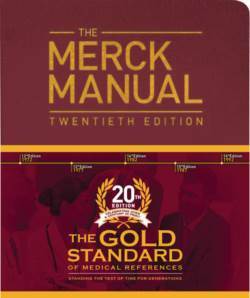 For more information on the Merck Manual of Diagnosis and Therapy 20th, go to www.rittenhouse.com or www.r2library.com or contact your Rittenhouse sales representative.